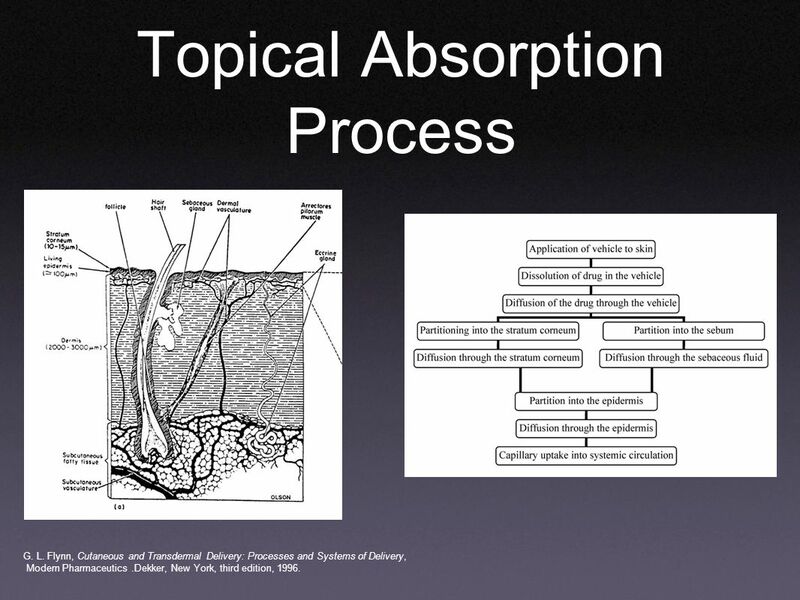 7 Topical Absorption Process G. L. Flynn, Cutaneous and Transdermal Delivery: Processes and Systems of Delivery, Modern Pharmaceutics.Dekker, New York, third edition, 1996. 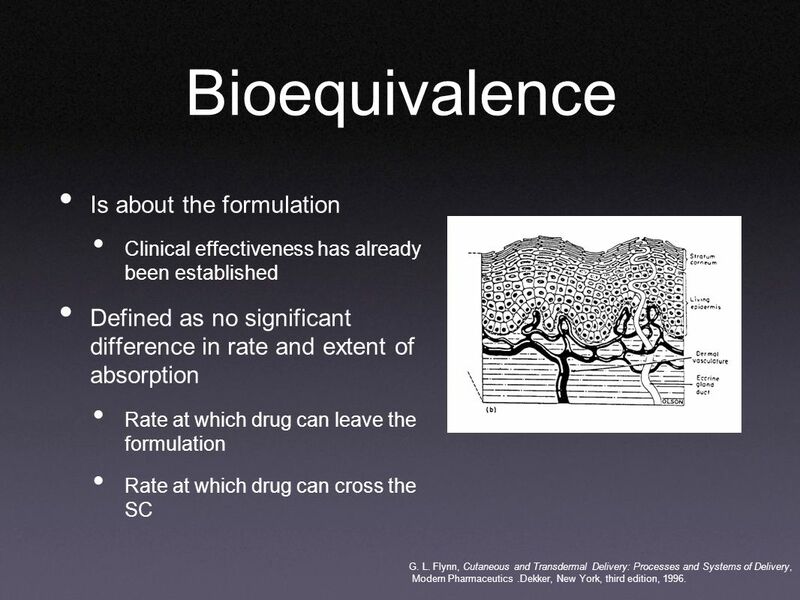 8 Bioequivalence Is about the formulation Clinical effectiveness has already been established Defined as no significant difference in rate and extent of absorption Rate at which drug can leave the formulation Rate at which drug can cross the SC G. L. Flynn, Cutaneous and Transdermal Delivery: Processes and Systems of Delivery, Modern Pharmaceutics.Dekker, New York, third edition, 1996. 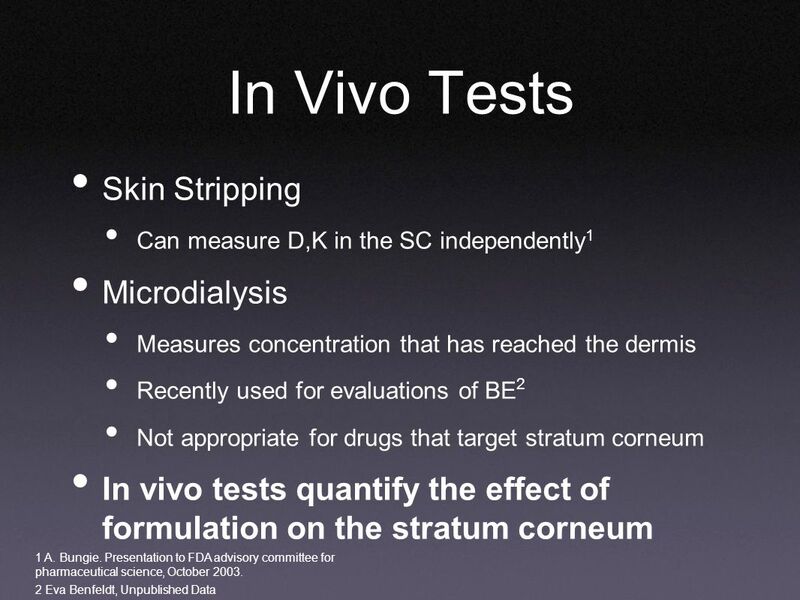 13 In Vivo Tests Skin Stripping Can measure D,K in the SC independently 1 Microdialysis Measures concentration that has reached the dermis Recently used for evaluations of BE 2 Not appropriate for drugs that target stratum corneum In vivo tests quantify the effect of formulation on the stratum corneum 2 Eva Benfeldt, Unpublished Data 1 A. Bungie. 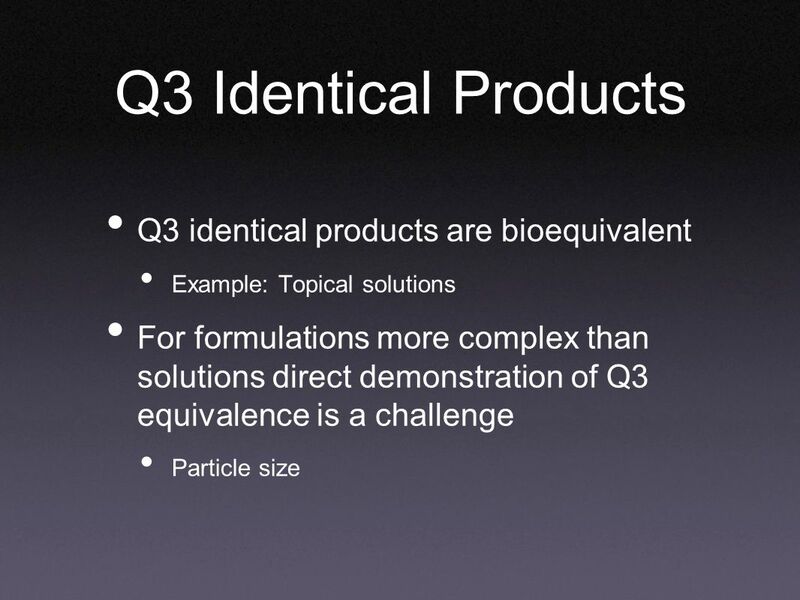 Presentation to FDA advisory committee for pharmaceutical science, October 2003. 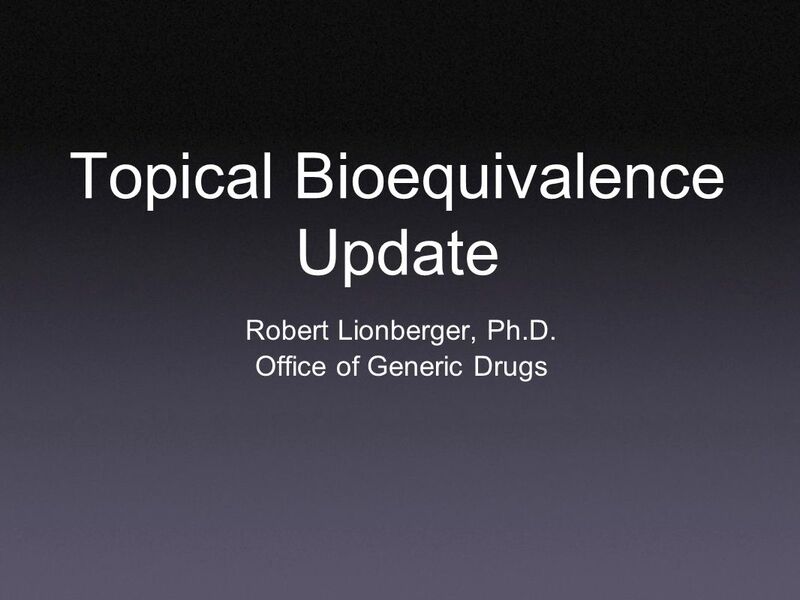 Download ppt "Topical Bioequivalence Update Robert Lionberger, Ph.D. Office of Generic Drugs." 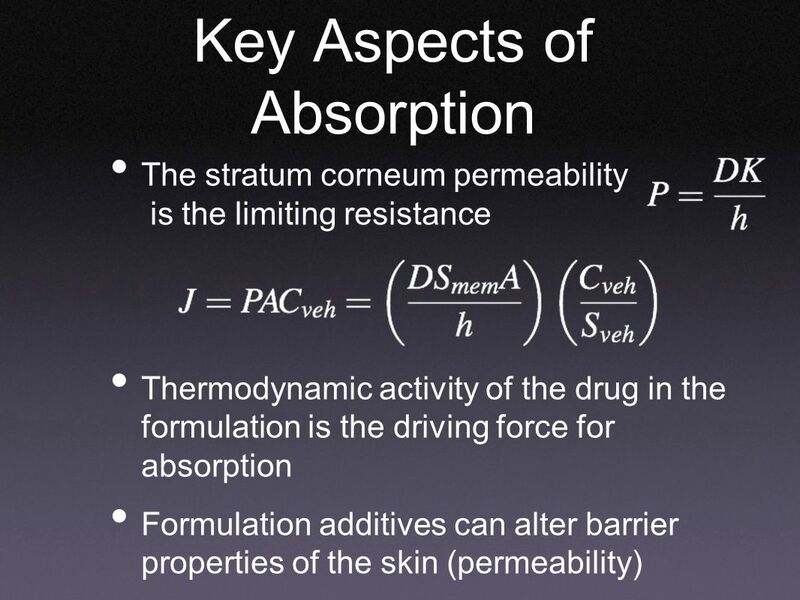 Ramana S. Uppoor, M.Pharm., Ph.D., R.Ph. 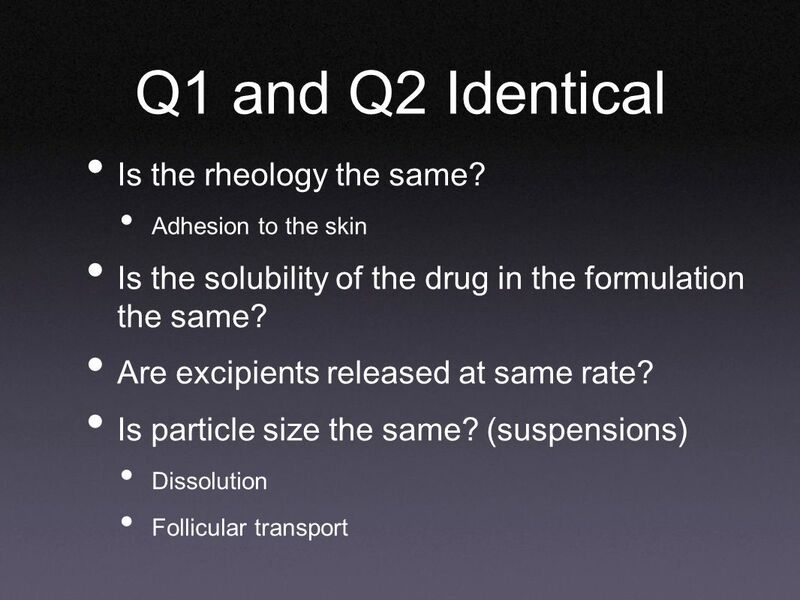 HOW DO DRUGS GET INTO THE BODY?. 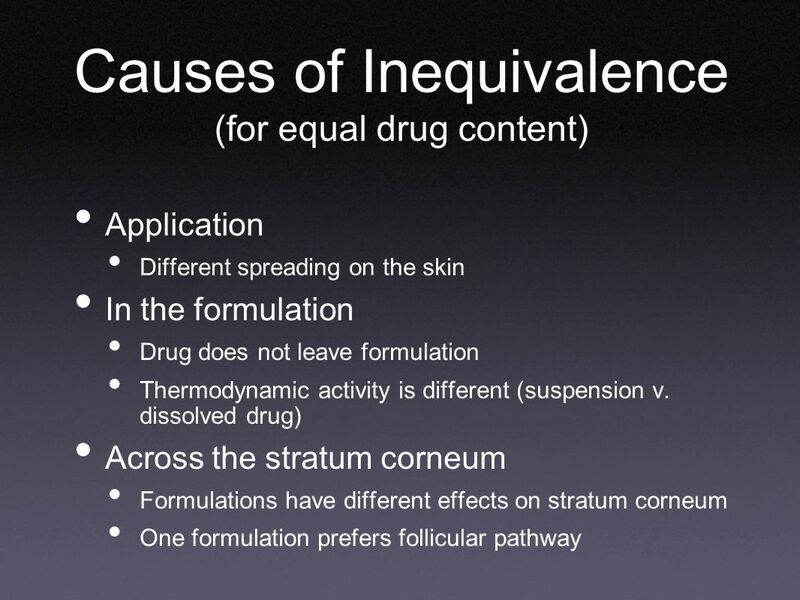 WHY BE CONCERNED ABOUT HOW DRUGS GET INTO BODY? 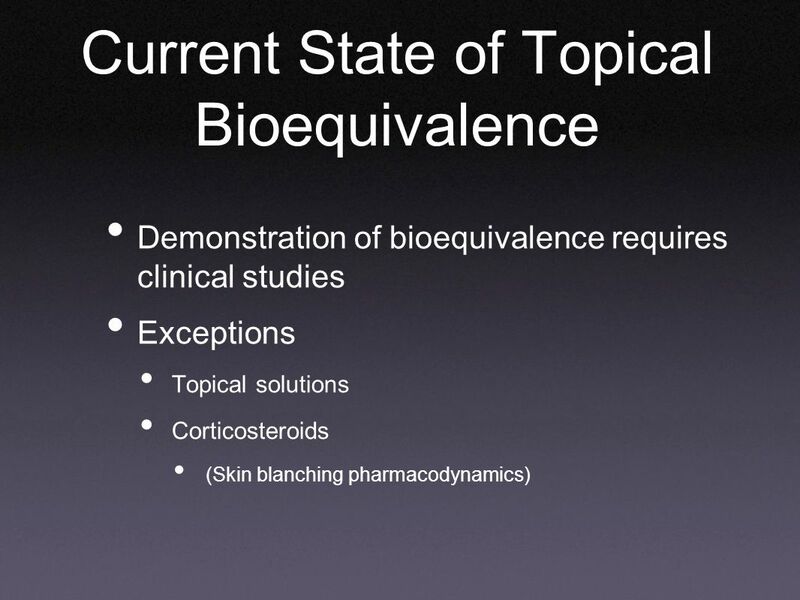 Bioavailability - % of dose that gets into body Bioequivalence - similarity. 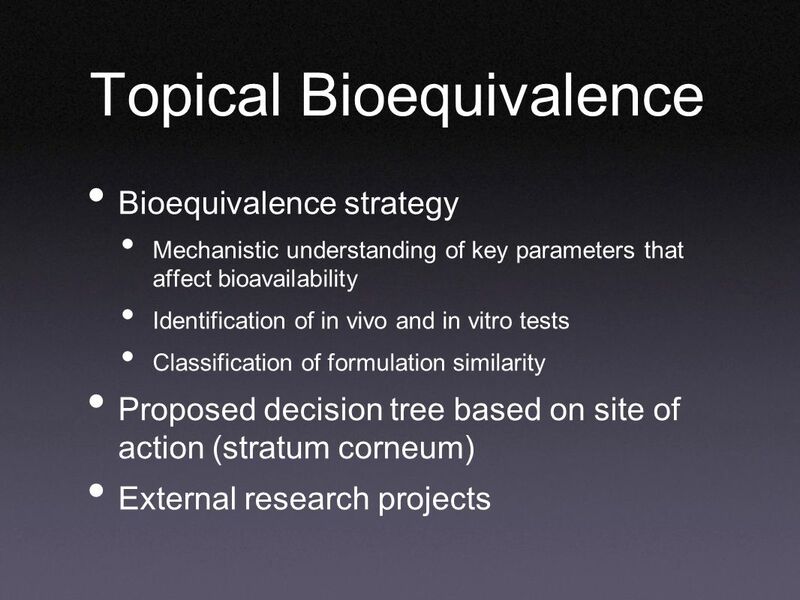 Clinical bioequivalence. 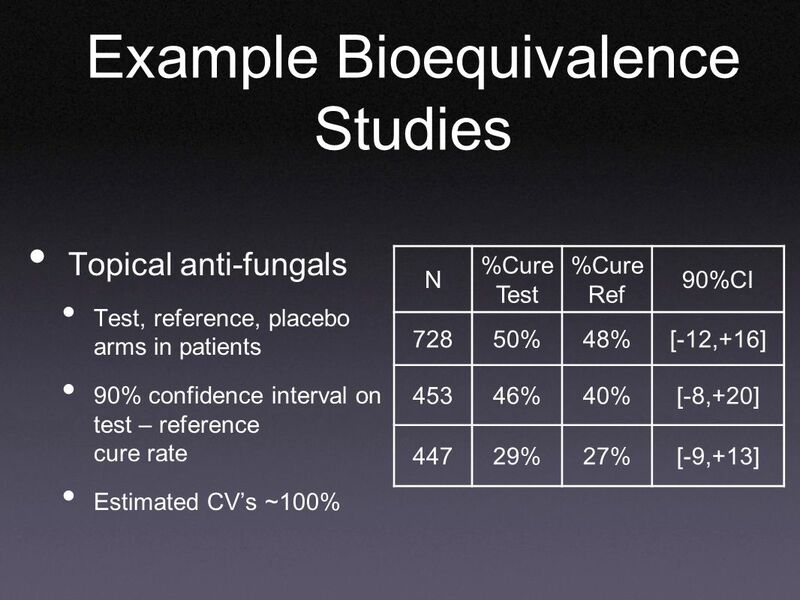 Specific example n A manufacturer wishes to change its approved production method for standardized fedweed pollen extract n CBER. 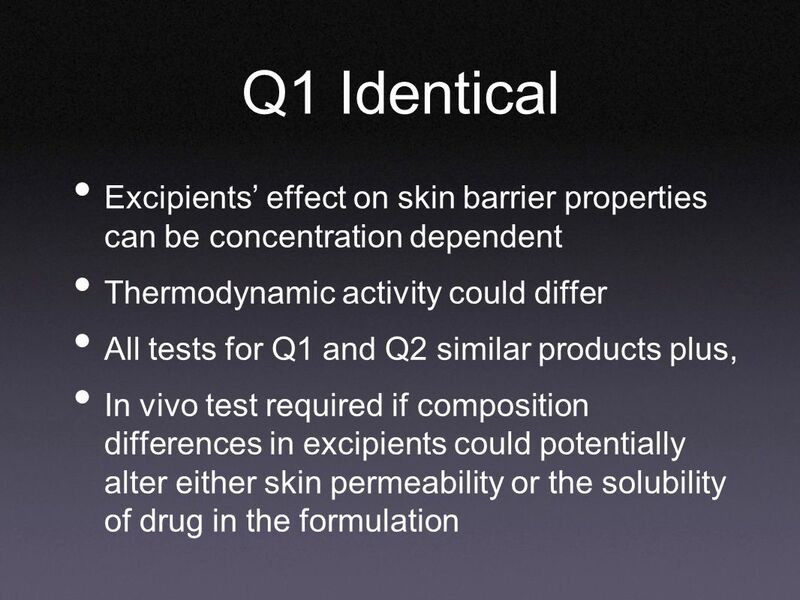 Skin Stripping vs. Acne Bioequivalent Studies for Tretinoin Generics. 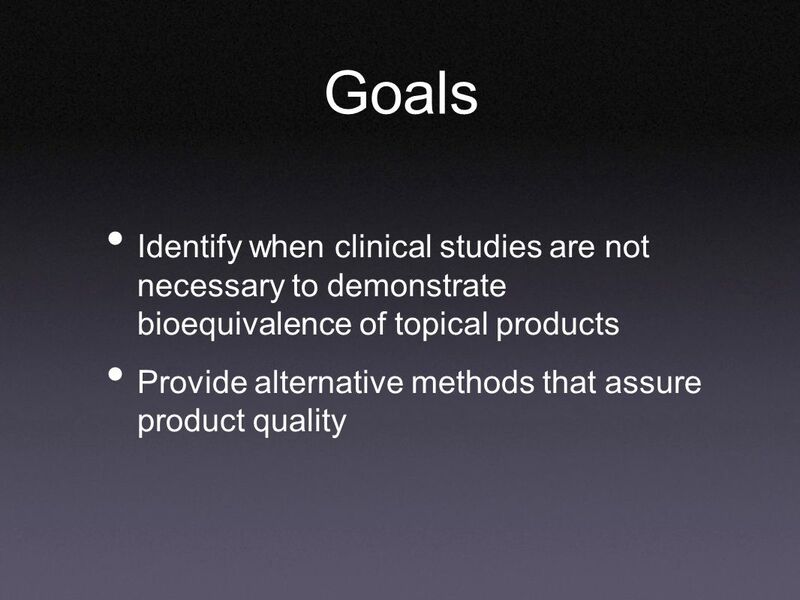 Comments at FDA-Advisory Meeting Nov 17, 2000 K.L. Spear M.D. / Dermatologist Spear. 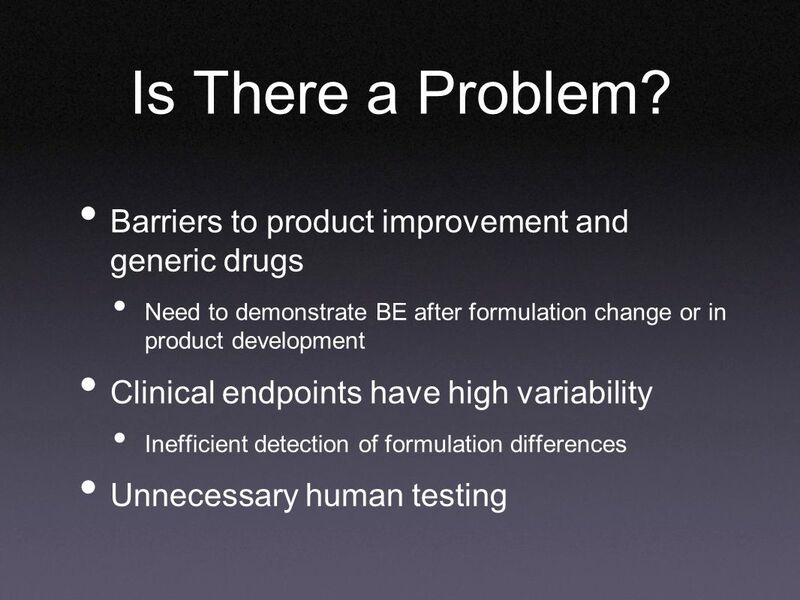 Pharmaceutical Nomenclature Issues and challenges Moheb M. Nasr, Ph.D. Acting Director Office of New Drug Chemistry (ONDC) OPS, CDER, FDA Advisory Committee. 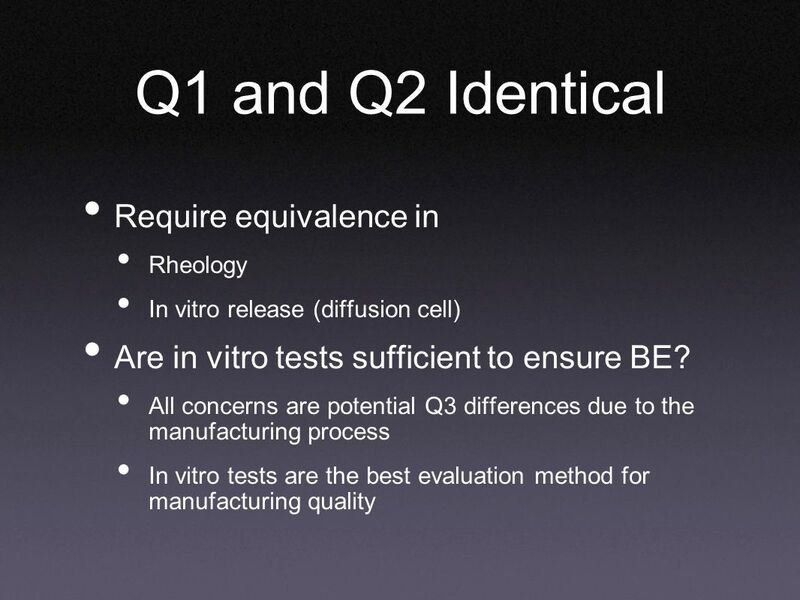 Kyiv, TRAINING WORKSHOP ON PHARMACEUTICAL QUALITY, GOOD MANUFACTURING PRACTICE & BIOEQUIVALENCE Introduction to the Discussion of Bioequivalence. 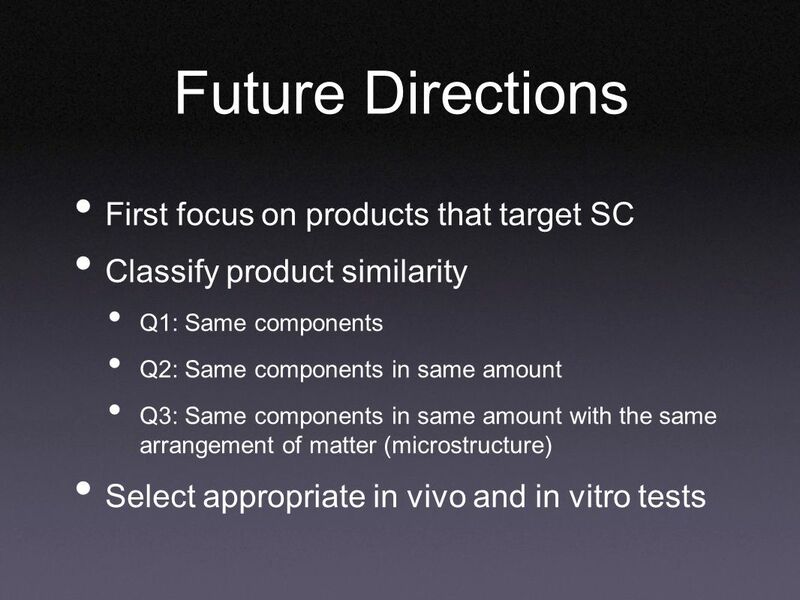 Office of New Drug Chemistry, OPS, CDER, Food and Drug Administration Establishing Dissolution Specification Current CMC Practice Vibhakar Shah, Ph.D.
Federal Institute for Drugs and Medical Devices The BfArM is a Federal Institute within the portfolio of the Federal Ministry of Health 1 Regulatory Requirements. 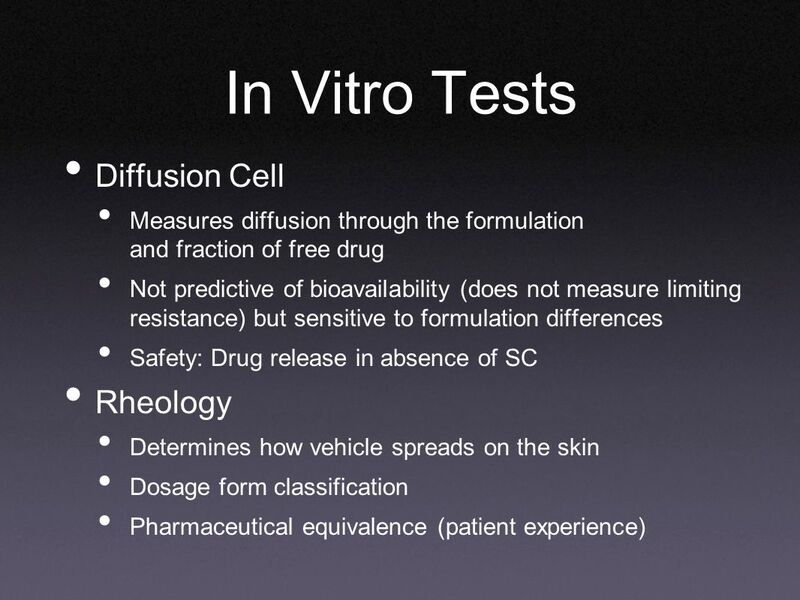 VINOD P. SHAH, PH.D. SENIOR RESEARCH SCIENTIST OFFICE OF PHARMACEUTICAL SCIENCE CENTER FOR DRUG EVALUATION AND RESEARCH FOOD AND DRUG ADMINISTRATION Pharmacy. 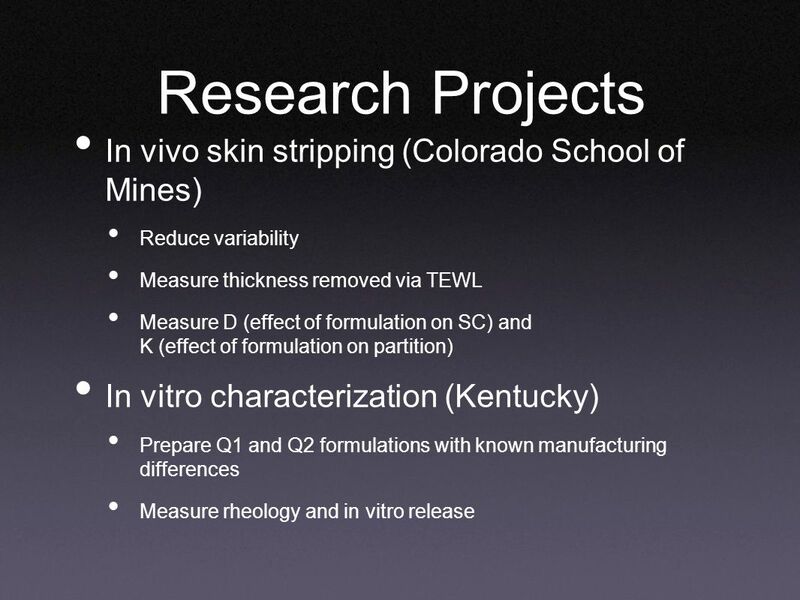 Transdermal Drug Delivery – Assessment of in vitro skin permeation Shashank Jain. 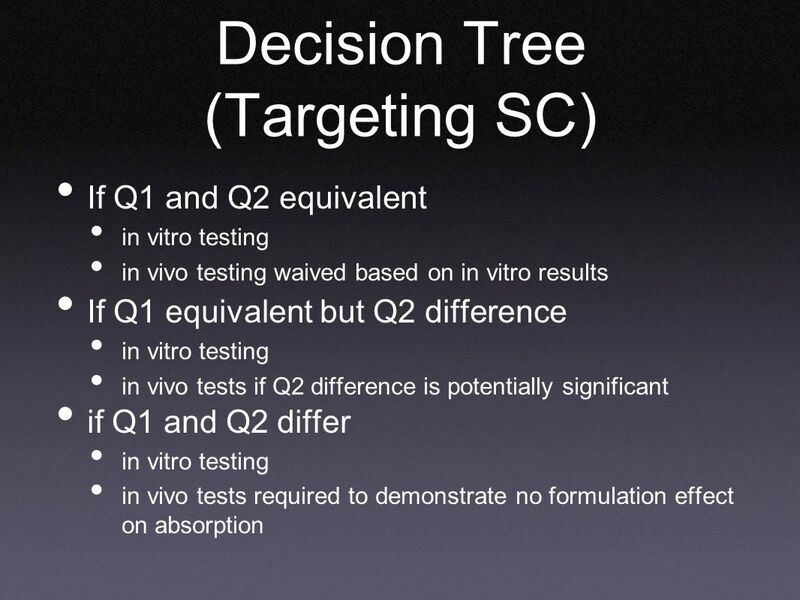 Hanoi, WORKSHOP ON PREQUALIFICATION OF ARV: BIOEQUIVALENCE Introduction to the Discussion of Bioequivalence Study Design and Conduct Presented. 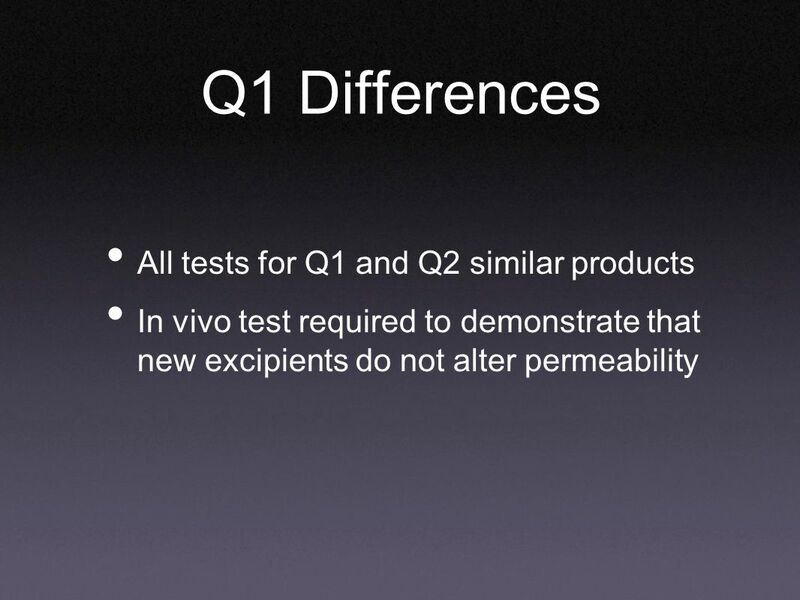 Interchangeability and study design Drs. Jan Welink Training workshop: Training of BE assessors, Kiev, October 2009. 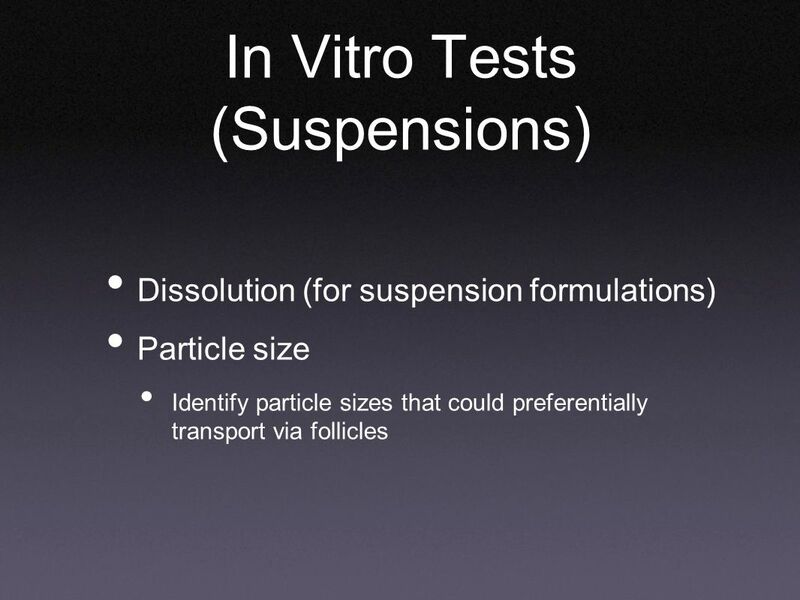 Dr. Muslim Suardi, MSi., Apt. Faculty of Pharmacy University of Andalas.